The 10th edition of the Gay Games ended on Aug. 11 in Paris. About 10,000 athletes from 91 countries vied for medals in 36 sports. Athletes from Team D.C. hauled in 231 medals in 13 sports with the swimmers from District of Columbia Aquatics Club leading the way with 121 medals. The swimmers competed at the swimming venue of the 1924 Olympics and D.C. swimmers shattered 15 IGLA (International LGBT Aquatics) world records. A couple things noted this year were that Team D.C. had sports couples competing together in swimming, rowing, golf, tennis, road running and volleyball. Also noted from conversations with athletes from around the world is that some older athletes are switching to sports that have less impact on their bodies. Their desire to compete is still strong and they are finding new sports to remain tied to the Gay Games. The next edition of the Gay Games will be contested in Hong Kong in 2022 and marks the first time that the event has been held in Asia. 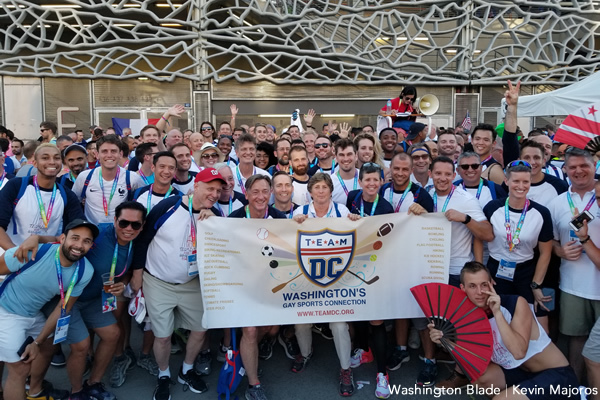 A Gay Games reunion and celebration party is in the works for mid-September for all the D.C. athletes and their friends. Below is a list of the Team D.C. medal winners.